… was born in the Innviertel in Upper Austria and became cabinet maker and joiner. Franz has been working as a freelance Artist in Handenberg, a small village in Upper Austria, where you find his workshop and studio. 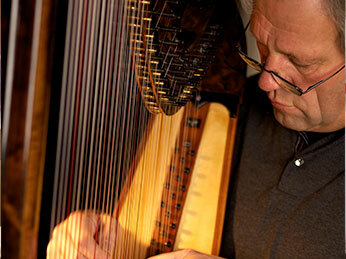 In 1984 he became conscious of the beauty of the harp and was immediately enchanted by it. Since then he has studied and researched in museums and has added improvements to the developent of the soundbox of the harp. Over the years he has developed his own method of harp building, which has led to a more intense and original sound and to a high quality of the making of the instruments.